Did you ever have one of those weeks, that feel really busy and tiring, on the go the whole time, yet feel at the end of it that nothing much has been accomplished? Well then, you know what this week has been like. It wasn’t bad, I got all sort of fiddly little tasks done, but it was somehow unsatisfactory, full of minor irritations. 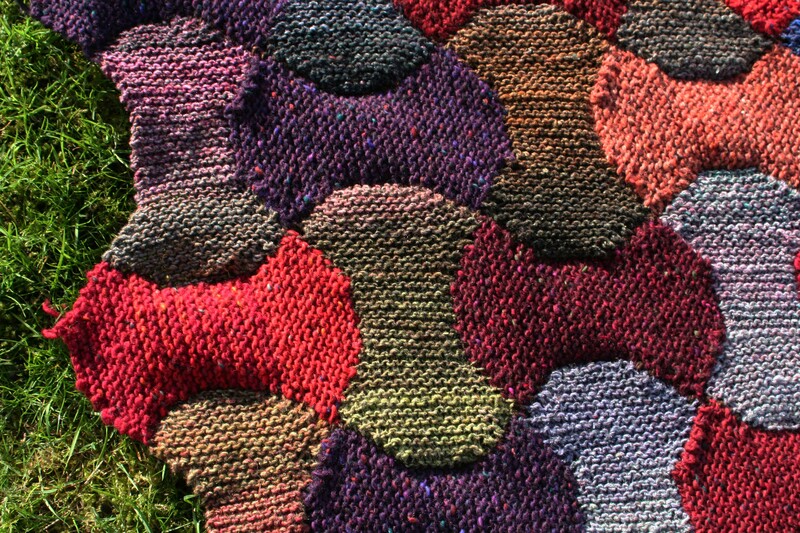 For example, my stashbuster Applecore Blanket (Frankie Brown), combining the best of Noro and Donegal Yarns (54 patches of each), is now in one piece. I had 2 balls of ancient single ply tweed in dark brown, one of which I used to crochet strips together and the other earmarked for the edging. The joining up went more smoothly than I’d dared hope: on wrong side ( slip st joining the thread between 2 garter st ridges on one patch and its equivalent on the other patch, chain 1), repeat all along the strip- it’s really quick and neat. See those wiggly seams on the wrong side? Much more fun than sewing! 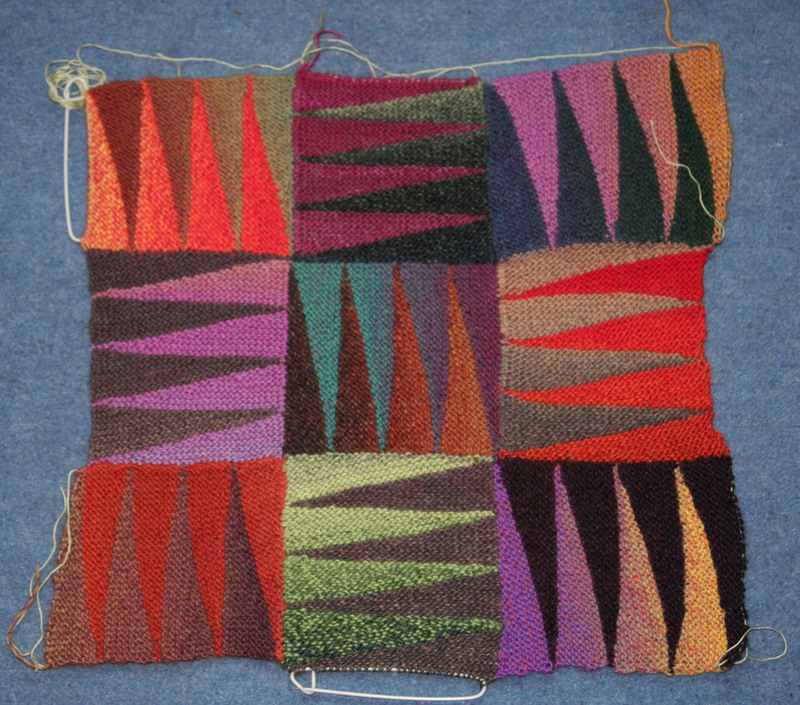 But then, just as I was feeling satisfied with what has been a really all-round enjoyable knit – frustration! – that 2nd ball of dark brown has disappeared. Now I know this apartment is in a state of creative chaos (oh alright, pretty messy), but it’s also very small, and I’ve been searching to no avail, so that I’m beginning to consider hallucinations or early- onset Alzheimers’. By the way, I deliberately haven’t blocked or pressed this, cos I like the 3D undulations. I think they go well with the rugged outdoorsy texture. 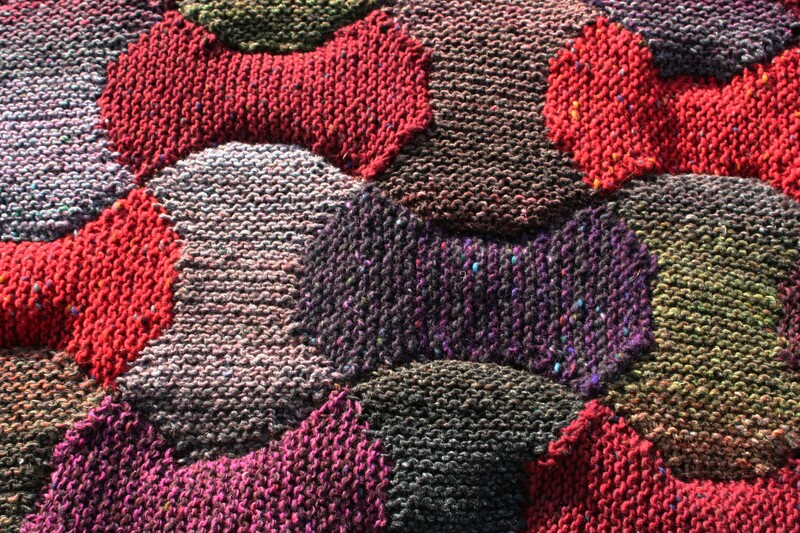 See the way some of the patches are stripey, cos they are made up of the last remnants of different balls (just like original patchwork quilts, where every scrap of precious fabric was used up)? I like the “wrong ” side too. FYI, I wove in the ends of the knitted-together short seams as I went along, and I crocheted over the remaining yarn tails in the long crocheted seams, so that was pretty painless! 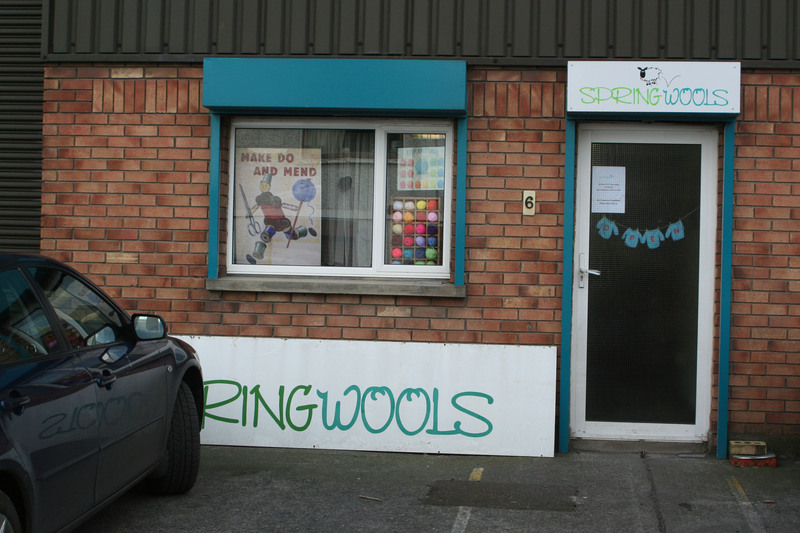 Now I’ve seen on my blog stats that quite a few people have been googling Dublin suppliers of Donegal Yarns/ Soft/Tweed/Studio Donegal/Kilcarra, so I thought I’d introduce one more source. 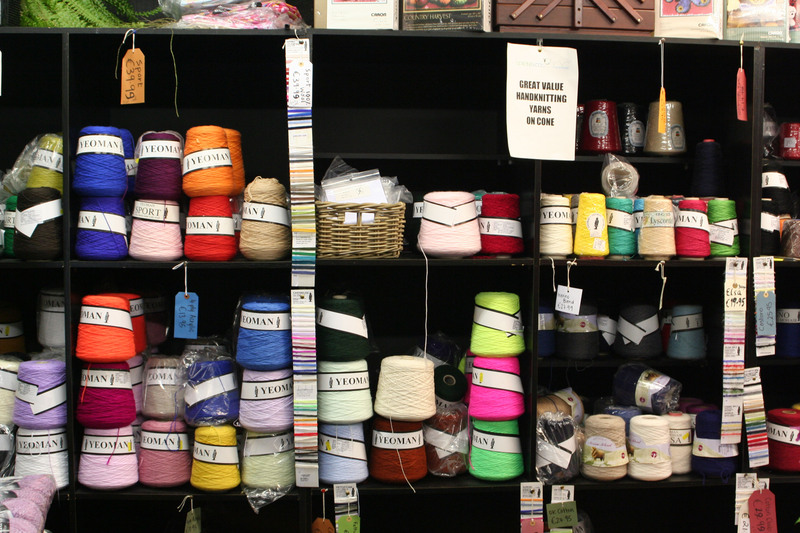 This is Knit, The Constant Knitter and Winnie’s all have a selection, but Springwools also has cones for (very) large projects. 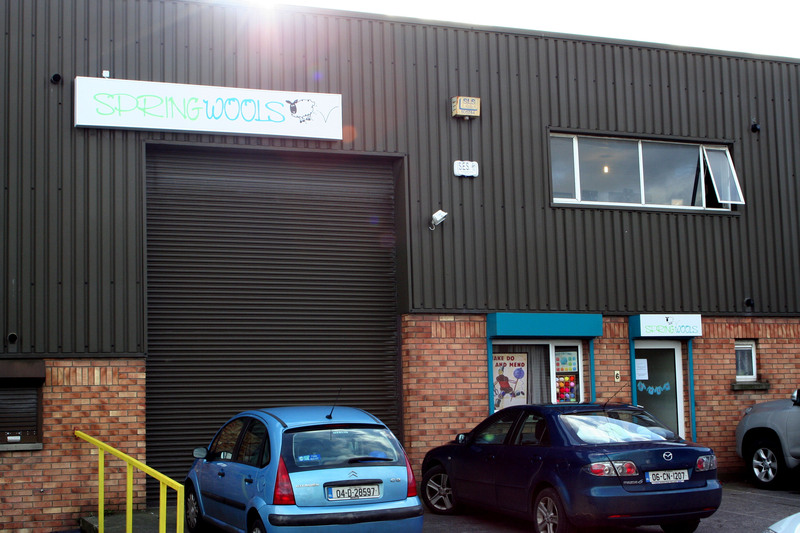 Springwools is to be found on the edge of an industrial estate ( Lower Ballymount Road), near Walkinstown Roundabout (handy for buses from the city centre), in a modified warehouse. I really like this sign. I really caught them at a bad time: to be fair, the shelves are usually a lot more orderly, but on Saturdays the ravening hordes generally descend on the place and stir it up quite a bit, as you can see. This is where I acquired the cone of fine mohair blend for my Froth cape, and some excellent quality Yeoman 4-ply (stunning colours!) for assorted hard-wearing garments for my DS. 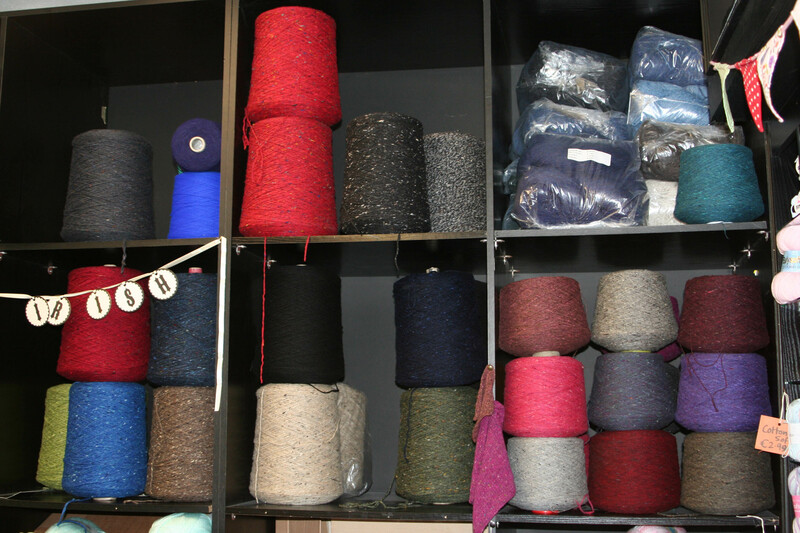 And here there is space to stock a selection of Donegal (tweed) Yarns on the cone, which work out at good value if you’re planning a big project, or sharing with a friend. 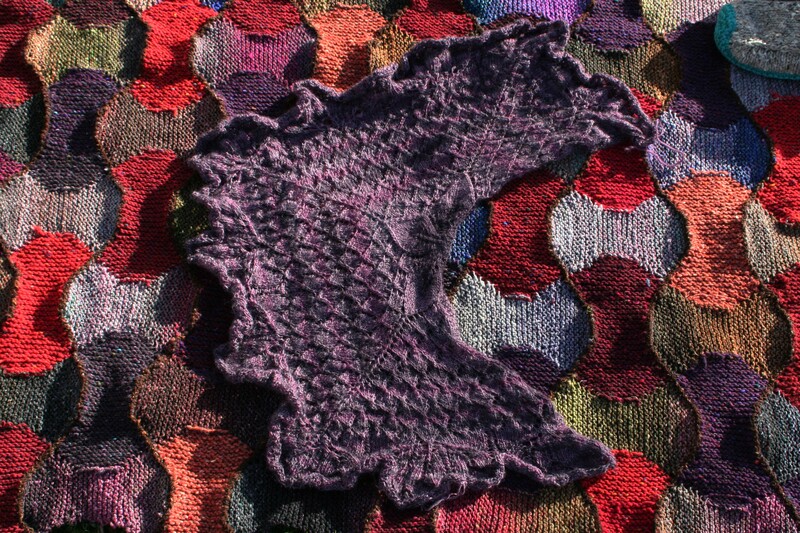 For example, I got one of these 2kg Aran weight cones in purple for 80 Euros, which was enough for my version of the Susie Hoodie (Mandy Moore, More Big Girl Knits) and for a goodly part of my Windmill Blanket (Curve of Pursuit, Susan Ashforth), both of which I’ve already shown you. 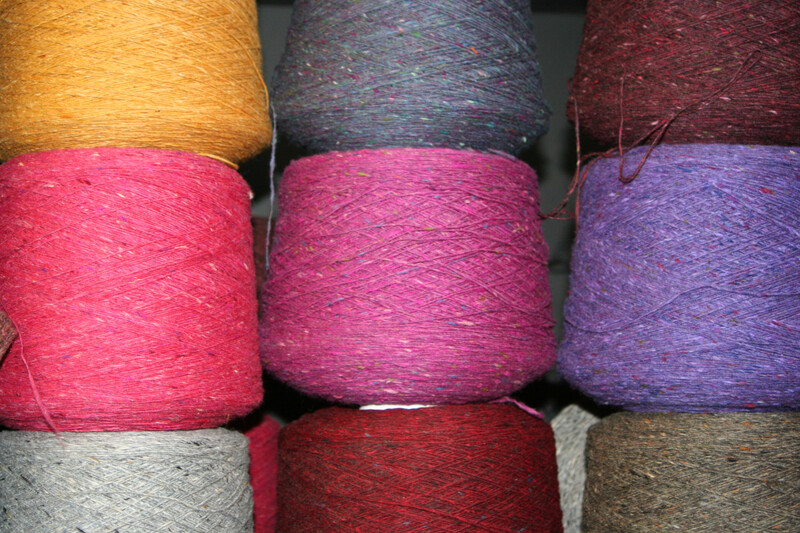 Then there are the 1kg single-ply cones (100% merino), for 50 Euros: one of these (the silver grey) was enough for my welted coat, a shawl, and I still have some in my stash for a rainy day, so that was a good investment. 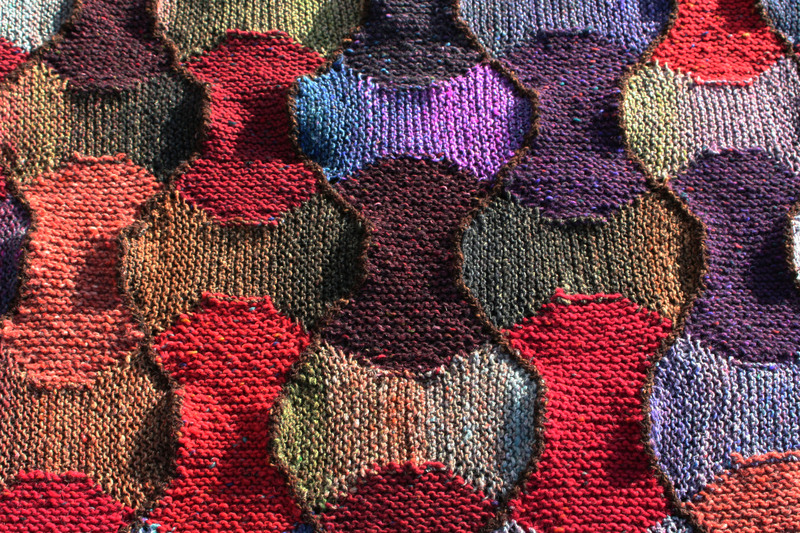 This stuff is “in oil”- I think that makes it suitable for machine knitting, too, but don’t quote me- that is definitely not my area of expertise (imagine letting a machine have all the fun)! Anyway, it smells “sheepy”, which takes me straight back to childhood summer holidays in Donegal and adds an extra dimension of enjoyment to knitting for me. The smell disappears after soaking or washing, though. 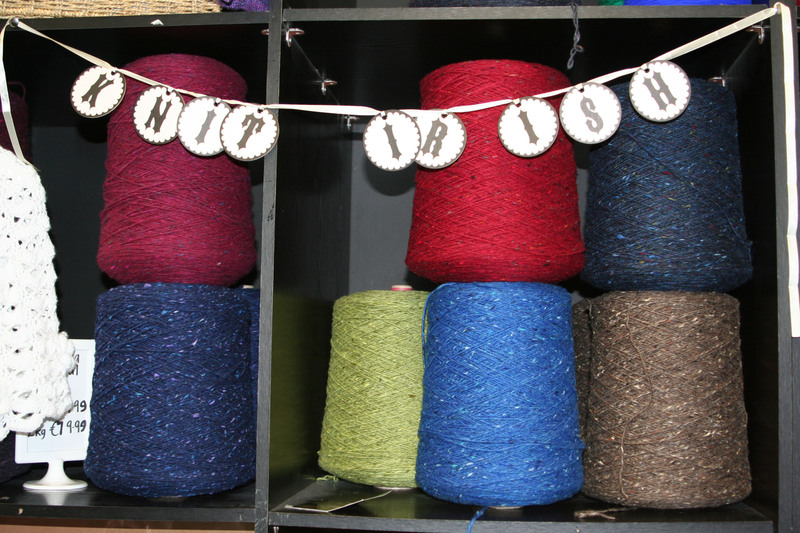 This yarn (washed) is also marketed in balls as Lang Yarns “Donegal”- I’ve no idea who supplies it though. 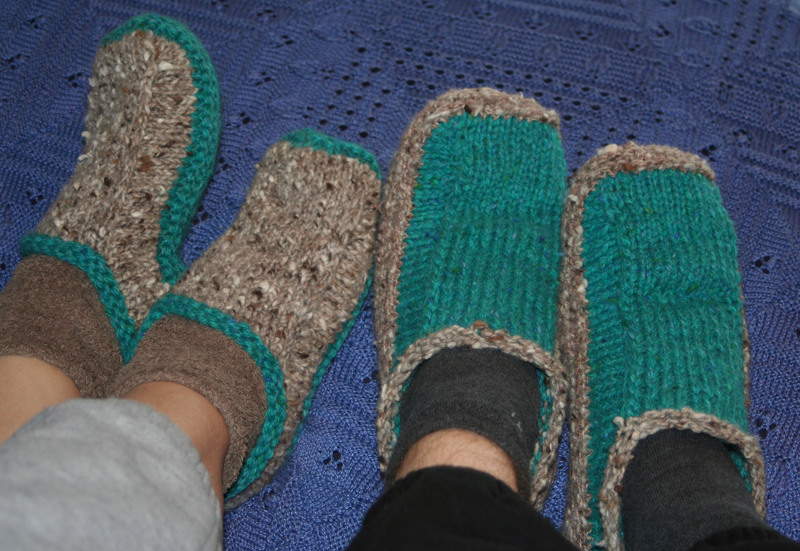 Remember my “Little’n’Large” versions of Yuko Nakamura’s slippers? 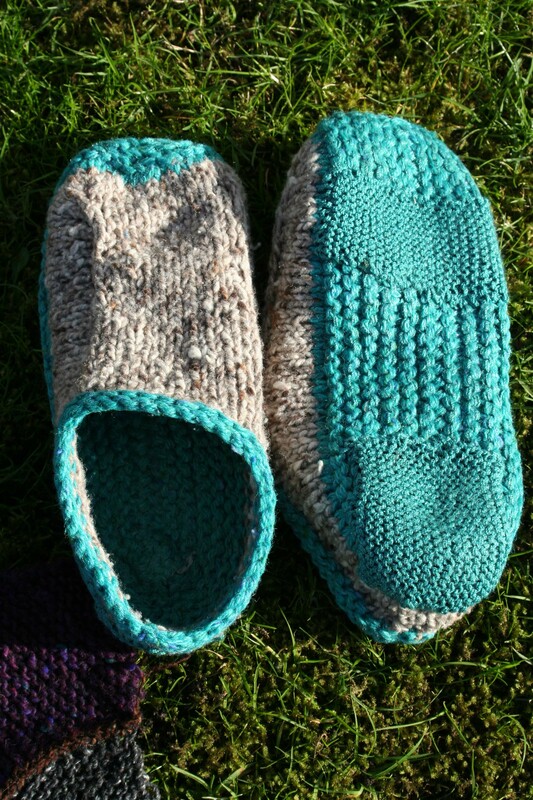 Well, I have been wearing mine almost non-stop since I finished them, even to bed on cold nights, so they were in need of some TLC, even though I’d mixed a synthetic -mix yarn into the soles. I was invited to lunch in Winnie’s on Friday by GF, so I knit little synthetic-only patches during the bus journey, and sewed them on when I got home. 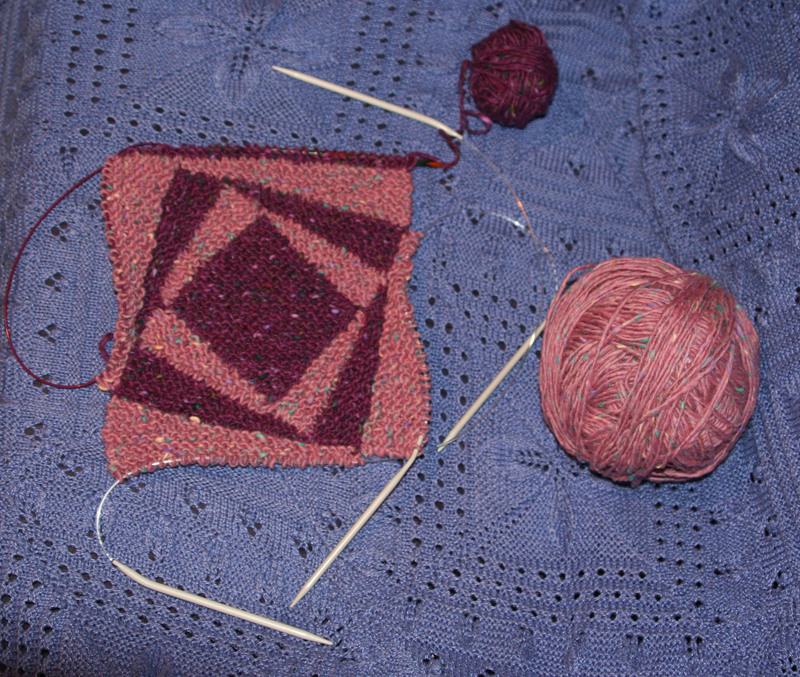 I started into the other Donegal stashbuster blanket I’ve dreamed up, but it turns out I haven’t got enough of some of the colours to do it the way I’d planned, so that has to be ripped back and started again. Like I said, it’s been one of those weeks…. 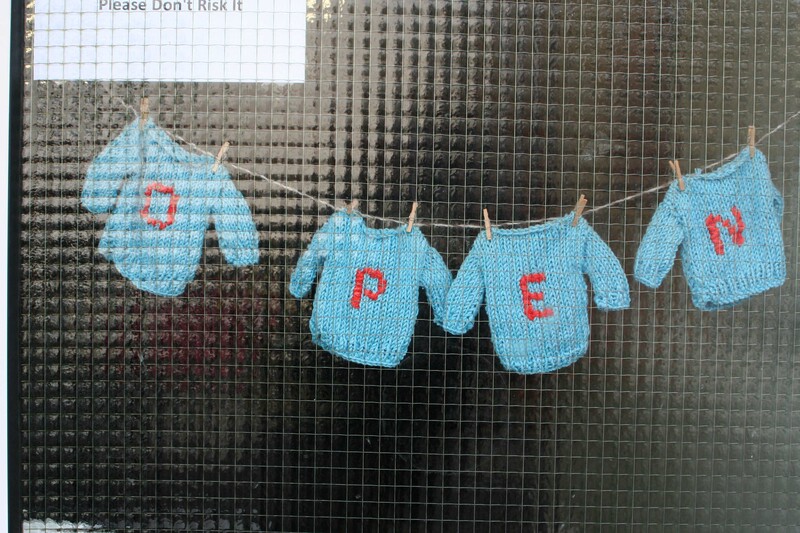 Mind you, knitting in the school is starting to gather momentum, as at least some parents are quite supportive. The “boys don’t knit” attitude is stamped into some of the kids though, it’s sad that such limitations are being placed on them at such an early age by their upbringing. However, their class teacher is very keen on equal opportunities for all her students, too, so we’re soldiering on! 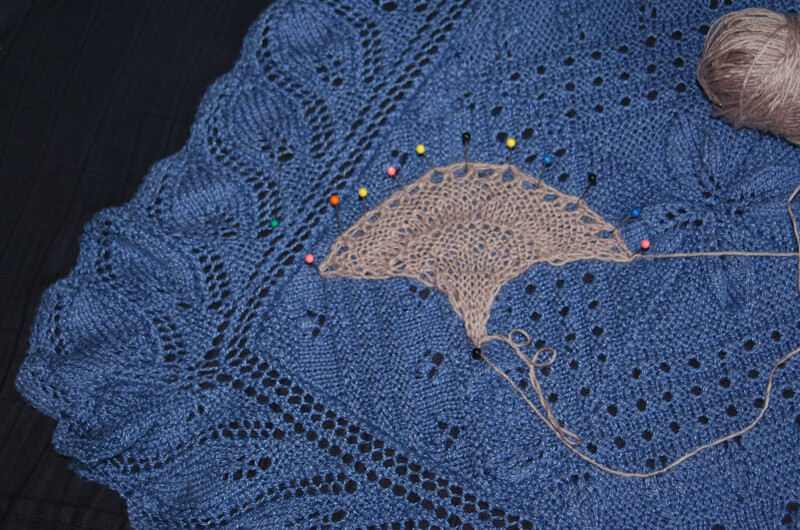 It’s a sure sign that it’s time to stop and take a deep breath, when I unearth an old project that I’ve never found time to block- the Orchid Thief shawlette (Ysolda Teague). This turned up when I was searching for that runaway?/imagined? ball of dark brown tweed. At the moment it’s a perfect example of how most lace looks like a dog’s dinner before it’s blocked, but it’s a pretty little pattern and the Lang sock yarn is very soft, so I’ll block it as soon as I can find/uncover enough clear floorspace. Whew! It’s been a madly busy week. 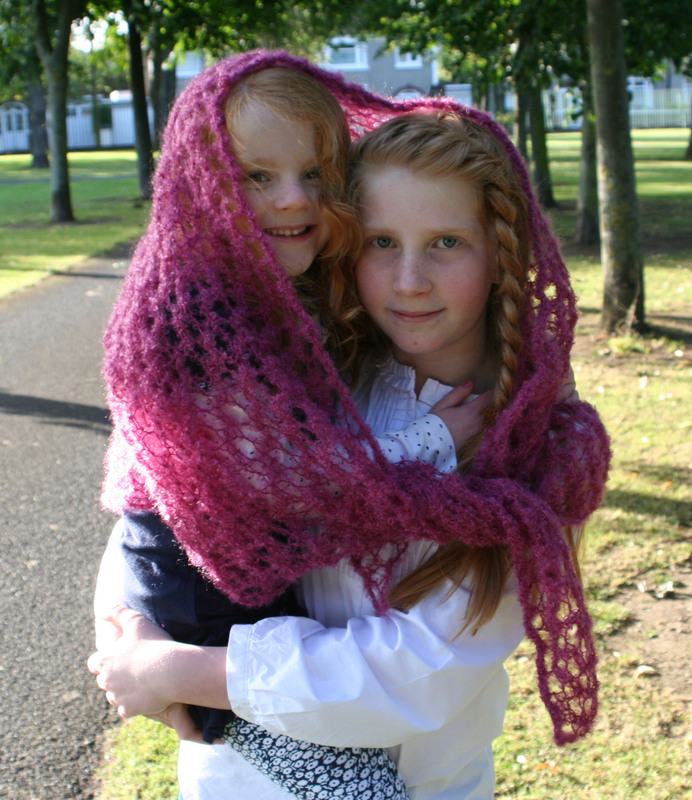 It started with my first photoshoot ever, with Niamh and Nessa and their mammy Breda from my knitting group, some of my first designs, and a camera in the park. 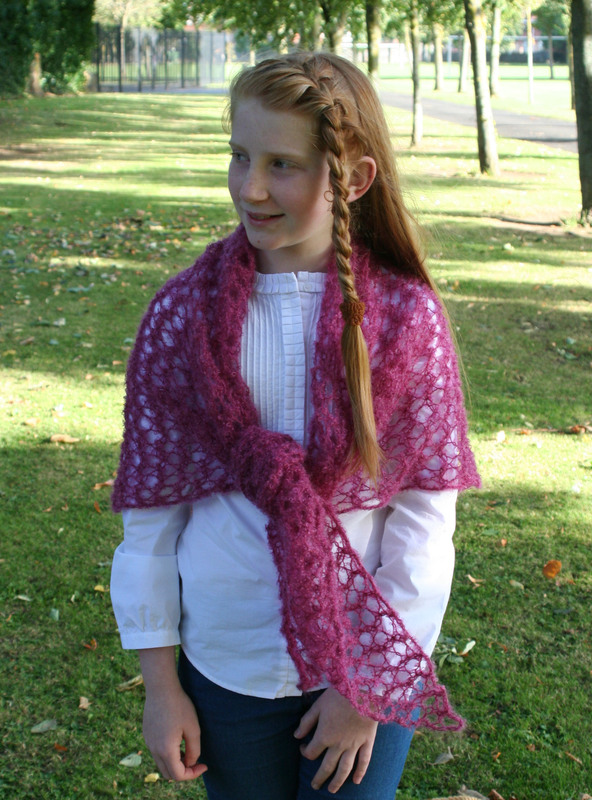 Niamh was my official model, but we were having such fun that Nessa joined in too, and happily shared my Pink Heather shawl (one ball of Cushendale boucle mohair/wool, fits 2 children or one adult). 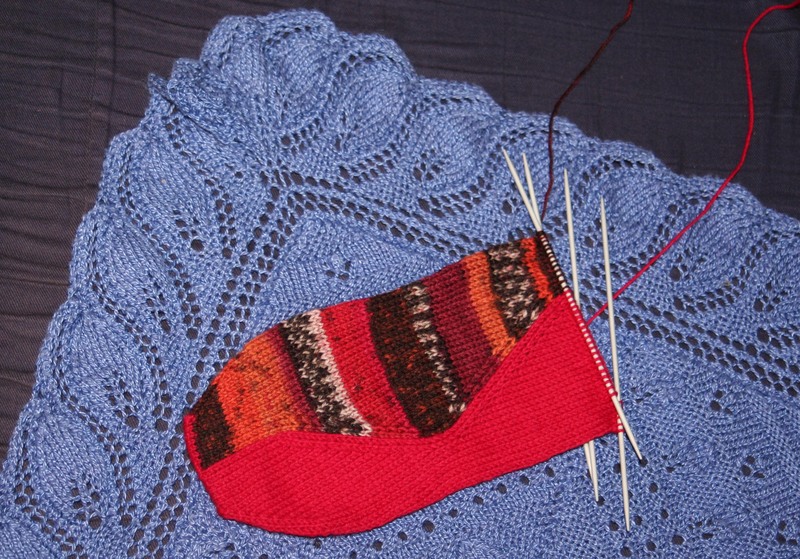 The pattern has been in preparation for an embarrassingly long time, but I’m nearly there, I promise! There’s been so much family/health stuff going on for the last year, I’ve been like a headless chicken trying to juggle. Hands up, every mammy who knows that feeling! Still, thanks to my lovely models, you’ve an idea of what I’ve been up to! There’s no denying it’s the time of year for woolly slippers and socks, at least in this part of the world, so this week I raided my stash for charity shop trophies and produced these two pairs of tweedy slippers. Thank you, Yuko Nakamura, for the free Ravelry pattern, it’s quick, easy and cosy! I modified the patt to fit a ladies size 39 (European) by casting on 58 sts, and a mans size 45 (do. ), 72 sts. We both have narrow feet (I prefer “slender”, myself, but the Son and Heir doesn’t…. ), so I left out a few rows in the soles. P.S. Used several fine, strong acrylic strands with the tweed in the soles, so they don’t wear out too quickly. Life’s too short for darning! 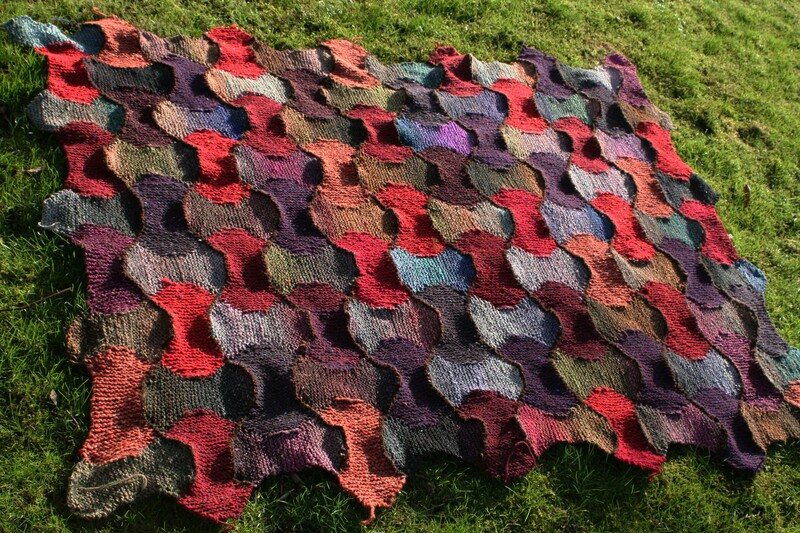 Just in case there’s someone out there who hasn’t yet noticed, Knitty Deep Fall 2012 is out, yay! I found these Stitch Surfer socks by Louise Robert irresistible, and my son is brave enough to wear them- what more excuse do I need? By the way, the blankie in the background is based on the Grandmother’s Garden patt in Claire Crompton’s Knitters Bible, and the edging I developed by simplifying the Great-Grandmother’s Edging in Barbara Walker’s second Treasury. Have I mentioned how much I admire BW? Let me count the ways… I have been her fan since I hit my teens, which was neither today nor yesterday. The cockleshell swatch is a tangible result of my busiest weekend in a long time. Friday evening was Dublin Culture Night, when museums, galleries, exhibitions and buildings of historical interest fling open their doors for free until 11 or 12 pm, and half the population of Dublin takes to the streets to gallivant and absorb as much gorgeousness as possible- the craic was mighty! The patron saint of culture was doing overtime, obviously, because not one drop of rain fell- definitely a minor miracle. I could write a guide book about the evening, but this is neither the time nor the place, so youse will just have to come and see for yourselves! However, I got a very knitterly thrill (as opposed to all the others, heehee!) in the Georgian House Museum in Fitzwilliam Street. This is one of a terrace which housed wealthy merchants (as opposed to the landed gentry in Powerscourt Townhouse) and has been renovated, complete with original contents of the period. And in the master bedroom there is a knitted openwork cotton bedspread in an interlocking cockleshell pattern, still in perfect condition! No photos allowed, groan! In retrospect, I shouldn’t have asked first, even if it would have got me kicked out on my ear. I’m obviously too law-abiding, I’ll have to work on developing a brass neck. So when I got got home I did a sketch, slept for a few hours, then headed off for the Weekend Marathon, part II. HandmAid Craft Day: basically, a fibre-filled craft fest for knitters, crocheters, weavers and learners, in aid of the Dublin Society for the Prevention of Cruelty to Animals, and I had volunteered to help with the yarn stall. Yes, I had an ulterior motive! Of course, I had an ulterior motive! Yarn was involved, and I’m a knitter, so join the dots! Culture vulture on Friday, stash vulture on Saturday: well, I’m a complex person. So yes, I swooped happily on bargains from my advantageous position on the right (i.e.uncrowded) side of the stall, until I had spent next weeks’ housekeeping money and had to stop (plus I couldn’t carry any more home on the bus). But the great thing was, there were so many donations that everyone went home with bags bursting with bargains; ” oh, I really shouldn’t, but…” was the phrase of the day, as my fellow fans caved in to the delights of everything from raw silk and hand-painted lace weight to cones of sufficient pure wool to knit a sweater for modest sums. It was a long, busy, friendly sort of a day and I think we all limped home exhausted but happy. All I managed yesterday was the shell swatch above (in new mystery bargain yarn). 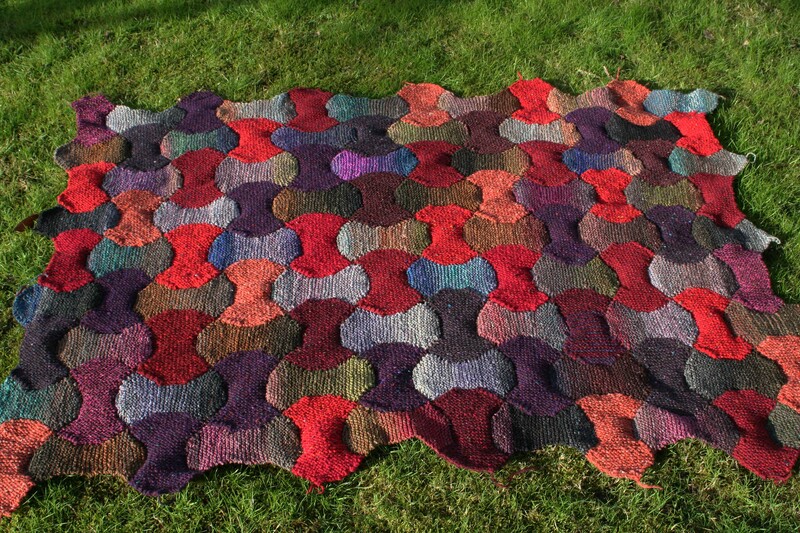 I haven’t got it right yet, but I consulted Horst Schultz’ “Patchwork Knitting” for the shape (if you don’t know his stuff yet, have a gander an Ravelry, I love his designs)- I’d love to re-engineer a Georgian bedspread…. And then there’s the cone of Donegal Aran tweed in pink, which will make a lovely Curve of Pursuit afghan (Pat Ashforth & Steve Plummer, aka Woolly Thoughts on Ravelry). The deep mauve is left over from my hooded coat (see Construction Site). So that’s my yarn diet: spend the housekeeping on yarn, then knit instead of eating! Do you think it’ll catch on ?